How are you making out with your holiday shopping? Ready for a few more gift ideas? In this second installment of our 2018 Holiday Gift Guide series, we present some of the gift suggestions that have hit our inboxes over the past couple of weeks. Unless otherwise noted, we haven’t done any hands-on testing, so be sure to check return policies and, if possible, take items of interest for a spin. Happy shopping! The take-anywhere VG1 could be the perfect gift for the outdoor traveler on your list. It packs a pair of 2-inch aluminum drivers in a compact enclosure less than 7 inches wide, supports Bluetooth aptX and AAC streaming, and is IP67-rated, meaning its impervious to dust and submersible in up to 3 feet of water. Rated battery life is 15 hours and it includes an accessory bag with a lanyard, USB charging cable, and 3.5mm audio cable. It also has a built-in microphone and is compatible with Siri for hands-free control. If you’re feeling really generous, step up to the VG5 ($449), which packs a 6-inch woofer, two 3-inch full-range drivers, and 60 watts of power in a weather-resistant enclosure that’s 17 inches tall. Like it’s little brother, it also supports Bluetooth aptX and AAC streaming and has a rated battery life of 10 hours. In a category dominated by mass-produced products, Portland, Oregon-based Triad Speakers prides itself on craftsmanship and customization. The two-channel OnWall Micro Sat 2.0 soundbar features four proprietary drivers — two 1-inch tweeters and two 3-inch woofers — housed in a fully damped and braced acoustic-suspension enclosure designed to hug the wall beneath a 55-inch (or smaller) TV. The cabinet is 40 inches wide, 4.5 inches tall, 2.75 inches deep and includes a mounting template and brackets. The standard finish is black paint but attractive wood-veneer options are available at extra cost. One- and three-channel versions of the Micro Sat are also available in standard or custom lengths up to 82 inches wide. It’s hard to imagine a better gift for the die-hard Stones fan than this limited-edition set featuring 15 studio albums spanning 45 years of rock n’ roll, starting with the 1971 classic Sticky Fingers and running through 2016’s Blue & Lonesome with 1978’s Some Girls, 1989’s Steel Wheels, and 11 others in between. Sourced from the original master tapes and pressed on 180-gram vinyl, each album was remastered and cut at half-speed at London’s Abbey Road Studios. Sign up to receive email updates and you get a 10% discount. Amico is a portable, weather-resistant version of the Top Pick-designated Solo music system we reviewed a couple years ago. 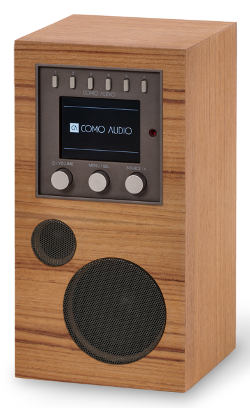 Housed in a sturdy marine-grade plywood cabinet finished in a beautiful teak veneer, the speaker boasts the same driver configuration (3-inch woofer and 0.75-inch tweeter) and versatility as the Solo (and Duetto): Wi-Fi and Bluetooth connectivity, multiroom functionality, an internet/FM/clock radio, color display, analog and digital inputs, and onboard access to several music streaming services including Tidal, Spotify, and Amazon Music. 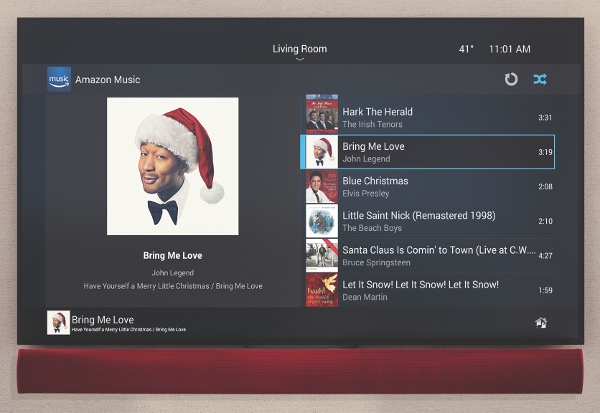 You have the choice of operating the system via front-panel controls, Como’s free app, or a supplied remote control and it’s Google Cast/Amazon Dot-ready. Amico is 9.4 inches tall and has a bass port on its back panel that doubles as a convenient carry handle. Rated battery life is 8 hours. 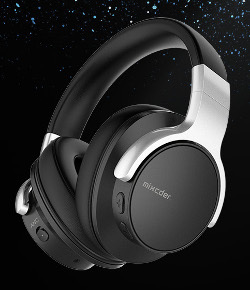 Mixcder, a West Coast-based company whose stated mission is to “create premium noise canceling headphones at an affordable price for everyone,” is offering a holiday special on its Mixcder E7. Said to reduce outside noise by 18 dB, the over-ear Bluetooth headphones have 2.5-inch drivers, padded earpads, and a built-in microphone for hands-free calling. Rated battery life is 20 hours and the ’phones include a carrying case, USB charging cable, and 3.5mm audio cable. Through December 25, you can buy E7 headphones for $40 using the coupon code NBNQFFQZ.